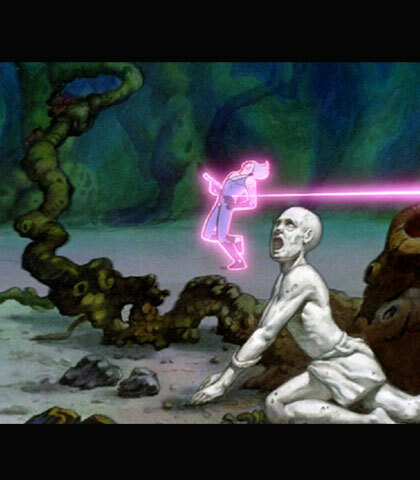 A whole generation of French children were brought up on René Laloux’s magical films, bussed to the local art-house cinema by their teachers to feast on the other-worldly sights of La PlanÃ­Â¨te sauvage (Fantastic Planet): buzzing plants and strange fruits, blue creatures shape-shifting to music and headless statues dancing together in space. Light years away from the bland slickness and smug cleverness of Shrek and co., Laloux’s films have fallen into obscurity, rarely screened despite the success they enjoyed on their release. Thankfully, Eureka have now made the films available in the UK, with last year’s DVD of Fantastic Planet joined by Gandahar and The Masters of Time (Les MaÃ®tres du temps) last month, providing a welcome opportunity to revisit this master animator’s wondrous world.. In a career spanning three decades Laloux only completed three features and five shorts, his work always constrained by budgetary limitations. It was while he was working at the progressive La Borde Psychiatric Clinic at the end of the 50s that he made his first foray into filmmaking. The success of a short animated film made in collaboration with the patients led to a meeting with Roland Topor (creator of the Panic Movement with Alejandro Jodorowksy and Fernando Arrabal). This marked the start of Laloux’s string of partnerships with respected illustrators: after making Fantastic Planet as well as two shorts with Topor, Laloux worked with Philippe Caza and Moebius on his following films. Although Laloux’s collaborators changed from film to film, there is a remarkable unity of vision in his work, which emerges not only through recurring narrative themes, but also through the intensely poetic visual world that is created. It is a world alive with movement and sound: in Fantastic Planet, vegetal tentacles sway to electronic warblings, while crystals fall like rain, covering everything with a hard, shiny surface that shatters when a small boy whistles. The enchanted forest of The Masters of Time hums and pulses with life, and the paradisiacal world of Gandahar is a lush land of plenty, in which bizarre farm animals plough the land and humanoid women pick bright red fruit from blue trees. Eerie sounds underline the strangeness of this world and, synched to the movements of the extra-terrestrial flora and fauna, make it come alive. These alien landscapes and the creatures inhabiting them are reminiscent of a dreamy and more benign Hieronymus Bosch. Never sentimental, it is a world that is poetic and cruel in equal measure: in one startling scene from Fantastic Planet a bird of prey attacks a humanoid Om tribe, devouring some of them before the rest of the tribe manage to kill it. The scene ends with the Oms drinking the bird’s blood. There is certainly nothing childish in Laloux’s animation, and the director explores some very serious themes. One recurrent concern is the sinister side of human civilisation. Both Fantastic Planet and Gandahar depict very advanced, refined civilisations that have a monstrous, inhuman side to them. In the former, a race of towering blue giants called the Traags, whose preferred activity is meditation, have enslaved the man-like Oms, treating them at best as pets and at worst as vermin to be exterminated. By reversing our own world order and placing humans at the lower end of the scale, the film strikingly underlines our own casual cruelty to all other living beings (the opening scene in which Traag children nonchalantly kill a female Om trying to run away with her baby is chilling). Most importantly, it highlights the danger inherent in establishing any kind of hierarchy between species or races, and in this warning one can see the trauma left by Nazism on Laloux’s generation. In a significant reversal of the traditional savage/civilised opposition, the ‘savage planet’ of the title becomes a place of hope for the group of rebellious Oms trying to escape the persecution of the supposedly civilised Traags. Gandahar explores a different, but just as dark, side of civilisation, and it is a variation on another Nazi nightmare, that of genetic selection. The people of Gandahar first appear to live in a utopian society where everybody is beautiful, food is plentiful, nature is luxuriant, and humans live in harmony with their environment. Having forsaken technology in favour of natural means, the people of Gandahar use mirror birds for surveillance and sprouting seeds for weapons. Emphasizing their perfect integration within the natural world that surrounds them, their main city Jasper is a human shape carved into the rocks of a mountain. However, when Gandahar comes under attack from mysterious steel men, the price that had to be paid to create this idyllic world is revealed: past genetic experiments have led to the creation of monstrous creatures, such as the mutant Transformés, or Métamorphe, a freakish giant brain that was left on a platform in the middle of the ocean when Gandahar’s scientists abandoned the experiment. Just like Métamorphe, the Transformés are not permitted access to the city of Jasper and are forced to live hidden away in underground caves. Kept out of sight of the beautiful Gandahar people for a long time, these past horrors are coming back to haunt them: it is quickly revealed that the steel men come from Métamorphe. It is therefore Gandahar’s own dark side that is now threatening its idyllic world: the attempt to engineer a perfect civilisation has resulted in the creation of brutal armies. The spectre of totalitarian oppression is also present in the opposition between individual and collective identity that runs through Laloux’s work. Métamorphe is a pink blob that absorbs individuals before turning them into empty metallic shells. The steel men all breathe as one, the loud, creepily regular Darth Vader-style breathing uniting them into one big collective entity that leaves no place for difference or individuality. The Masters of Time also features a big blob that reviles difference and promotes unity above all else, turning all those who approach him into blank-faced angels. More ambiguous than the sinister steel men, the angels point to the dangerous allure of the totalitarian discourse that promises harmony and happiness in return for relinquishing all individual will. These reflections on human civilisation are inscribed in wider philosophical considerations about the surrounding universe, a universe that is governed by a process of constant transformation. The steel men turn the Gandaharians to stone using petrifying ray guns before placing them into egg-shaped prisons. When these eggs go through the door of time, the Gandaharians are turned into more steel men. The eggs, the empty shells of the steel men and the petrified Gandaharians all point to the unstable nature of being: in this universe, identity is not a fixed given but is constantly fluctuating so that the Gandaharians are threatened by their own transformed selves. There are no simple oppositions between light and dark, between beautiful and monstrous, or between organic matter and steel; rather, they are one and the same thing at different stages of evolution. The Transformés most clearly represent this process of constant metamorphosis: their misshapen bodies are not stable forms but keep mutating. As a result, they shun the present tense and instead use a strange mix of future and past tenses. The living embodiment of the continuous flux of time, the Transformés exist in a zone that hovers between past and future. This interest in a non-linear, non-fixed time leads Laloux to explore temporal paradoxes in both Gandahar and The Masters of Time (although in the latter film the temporal paradox feels somewhat like an underdeveloped afterthought). In Gandahar, the beautiful people of the present civilisation coexist with their mutated selves who have come back from the future to destroy them. But it is less the temporal paradox in itself that interests Laloux rather than the investigation of time as a parameter of a universe in a permanent state of mutation. Some of the ideas in Laloux’s films were part of the zeitgeist of the 60s and 70s – the abhorrence of a dehumanising, collective identity, eugenics, ecology or out-of-body experiences – but, integrated into a magical world that weaves visual poetry and philosophical musings, they never feel dated. As Moebius remarked, Laloux is ‘an artist outside of time’, and having developed his style far from any fads or easy categories, he’s remained a unique voice in animation. Thirty years later, his films have lost none of their ability to make children and adults alike dream with their eyes open.